VOLUNTEER & GET IN FREE! 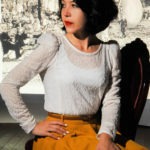 Keri King is a cross-disciplinary artist based in Providence, RI. She received her BFA in Illustration with a Concentration in Creative Writing from the Rhode Island School of Design in 2005. Today, Keri’s creative practice incorporates illustration, public art, storytelling and the occasional foray into performance. 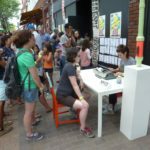 In 2016, Keri self-published her first narrative picture book, Spectacles & Spectators, and was awarded a grant from Providence Art, Culture + Tourism to create a multi-site installation for PVD Fest. She recently wrapped up a yearlong Creative Fellowship at Providence Public Library and is currently installing a series of murals up along the waterfront and Armory neighborhoods of Pawtucket, RI for the city’s annual arts festival. Keri also lives at AS220! Find out more at http://www.kerikingstudio.com/. For Foo Fest 2018, Keri will create designs that will be incorporated both into the festival itself and its promotion, including: the official hand-printed Foo poster; merchandise; site design; and more. On the day of, Keri and friend Carmel Dundon will be hosting Crowns & Costumes art activities for children and families from 1 PM – 6 PM – Keri will then lead the FOO FEST PARADE, featuring artwork made by children during the day, at 6:30 PM! Ricky Rainbow Beard is the creator and host of a live theater production for children and their families called ‘The Rainbow Beard Show’. Held bi-monthly at the AS220 Black Box Theatre, it is equal parts spectacle and classroom. Audience participation is encouraged and each ‘show’ features special guests, recurring characters, minute-long dance parties, and a celebration of authentic feelings. 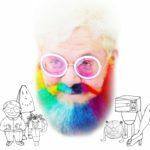 Ricky Rainbow Beard will act as Foo Fest 2018’s MC throughout the day, entertaining kids and encouraging them to get involved with activities available across the site! 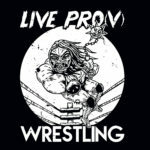 Live Pro(v) Wrestling hosts monthly wrestling at AS220’s Black Box Theatre. To celebrate Foo Fest, the heroes and villains of Live Pro(v) will take their battle outside onto Empire Street! Take part in a family friendly show with characters such as a telekinetic meta-human-supervillain built in a mad scientist’s laboratory, a tuna with a wicked Rhode Island accent, a tyrannical king from the realm of Beaheadya, the world’s unluckiest pizza delivery guy, an easily distracted cat, and bunch of real meanies that are really asking for a bruisin’! LPW seeks to make a space that feels welcoming to both casual and die-hard supporters of professional wrestling, get there early to get your mind power-slammed! The Providence Comics Consortium teaches comics and cartooning at Providence Community Libraries all over Providence! AND they publish work by kids and comic artists of all stripes! At Foo Fest 2014 & 2015, the Providence Comic Consortium was on hand to pass out much-needed advice for Foo Fest goers to live by. It was a hit! The Consortium returns to Foo Fest 2018 with the promise of hands-on making activities. Who knows what kind of zany wackiness you’ll experience on the day! Musician, storyteller, cartoonist, and stand-up comedian for kids will be bringing his special brand of entertainment to the festival. Keith has been performing at AS220 since we first began back in 1985. His comedy theatre show, The Empire Revue, takes place every month at AS220’s Main Stage. Keith also teaches and performs musical improv at The Providence Improv Guild (www.improvpig.com). 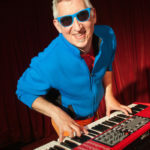 As a composer, Keith has created original music for Perishable Theatre’s Shows for Young Audiences, as well as main stage productions, Manton Avenue Project, and choreographer Heidi Henderson. 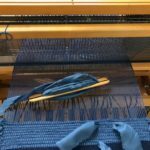 Leslie will be bringing her looms from her studio outside to Empire Street during Foo Fest 2018. Please join her in weaving a new work that, once completed, will be installed in the Open Window at 115 Empire Street. Leslie is a work studio resident in AS220’s Dreyfus building. Leslie integrates her interests in language and textiles in her artwork. She has degrees in Spanish literature and linguistics from the University of California, Los Angeles as well as a BFA in painting from the Massachusetts College of Art and an MFA in fibers from the Tyler School of Art, Temple University. AS220 Youth participatory activities and Youth-made merch! Hands-on making activities with AS220 Industries, including printmaking and more!